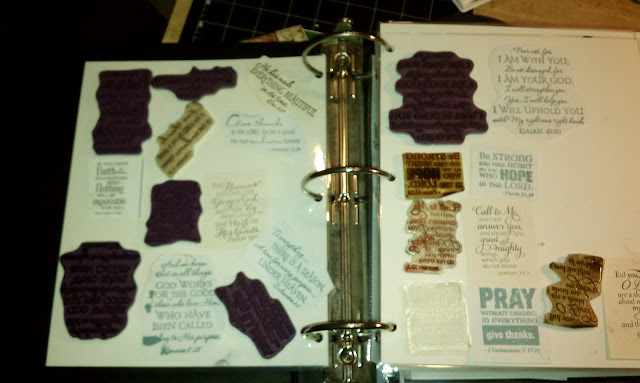 Yesterday I unmounted my wooden Sentiment, and Scripture stamps. I like having things that are like, and it bothers me to have things unlike. Needless to say I excelled in my third grade 'what things are like and what things are not like' exams. There must have been secret nuclear testings in New England wafting out radioactivity that day in 1968, because my brain forever froze in that mode. I don't like mixing my markers, I like having whole families of types of ink pads. Everything plays together better when they are 'like'. 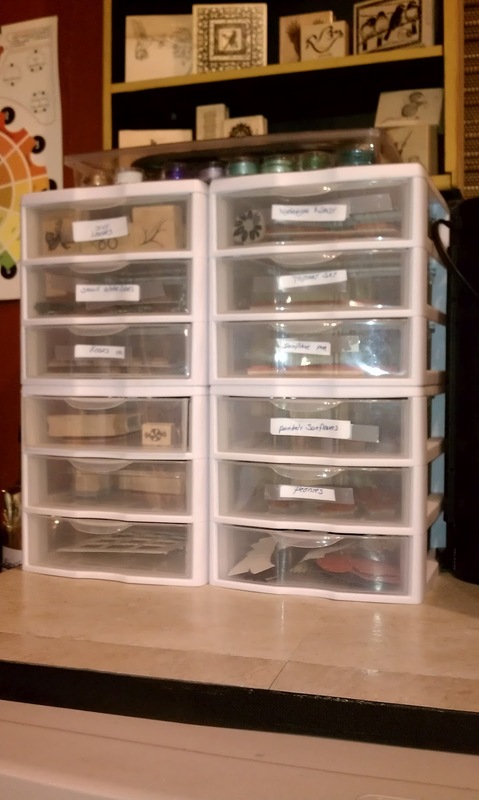 So it really made sense to end the dilemma of trying to remember which stamp was where, in a drawer or in a binder. They are now ALL in a binder!! Not only are they all together and not in 5 different places, they are all indexed. 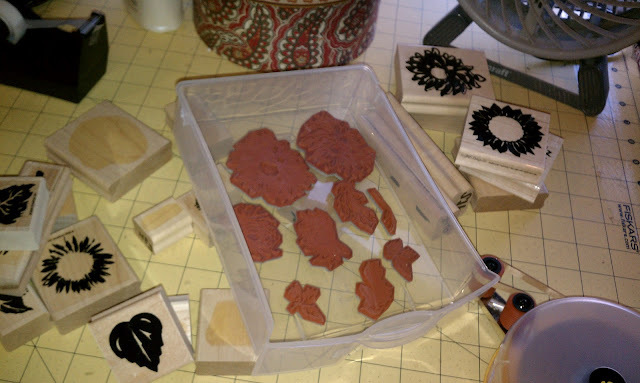 So I have some good organization happening and these stamps are by far easier to accurately stamp using a clear block. 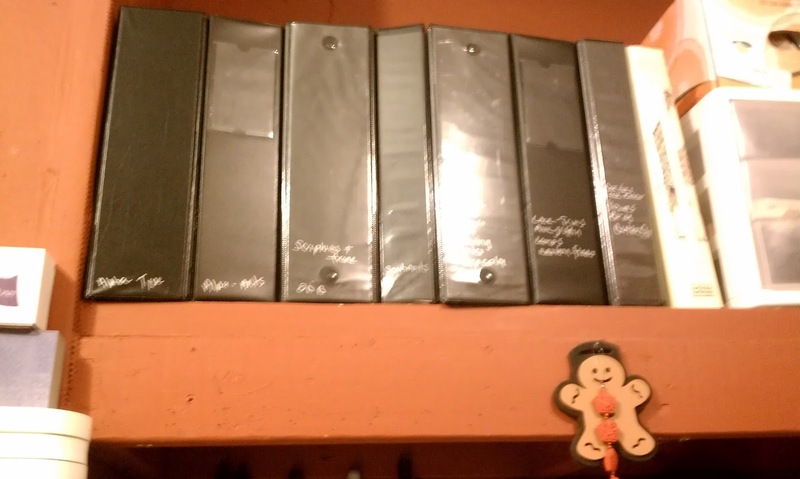 I also have my unmounted stored and indexed in similar binders, they all live on the same shelf. These are right over my head, my computer desk is in an alcove and Steve built a sturdy shelf over it. 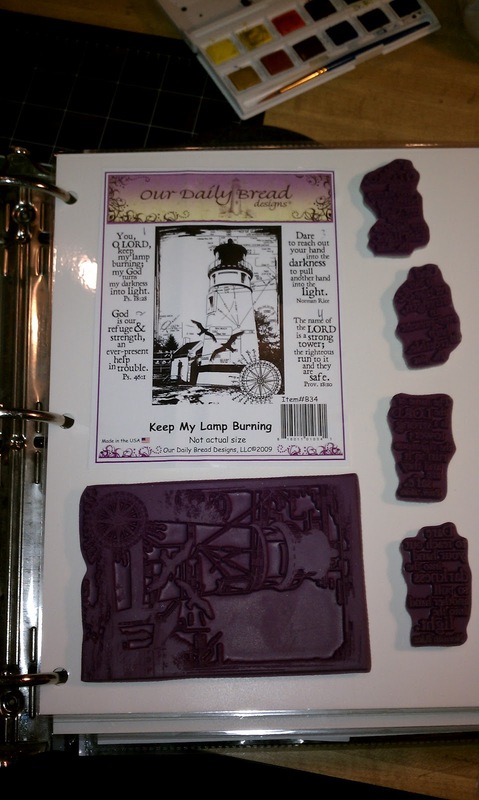 Now I am going to Quote Vickie " I have unmounted most of my stamps now and I play with them a lot more this way! " Others have said they couldn't do it, no way!! Well I took another step today in the unmounting process I did most of my Stampin' Up two step stamps!! I have a few left to do. I love the images that I have but they are little pains trying to get them aligned , seeing through wood is pretty tricky, I never mastered it!! Now using them on a clear block, what a difference! Hopefully I can make some cards tomorrow using a set or two of these!! I will be able to store about 40 sets here in these 5x7 drawer sets! I don't plan on ummounting everything. I just want to better utilize what I all ready have and improve the quality of what I do. So what is your preference? Mounted or Unmounted?